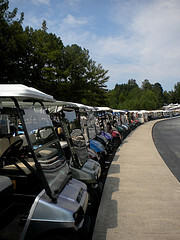 Lest you think I only use my golf cart for golfing, it is a way of transportation here in Peachtree City, Georgia. 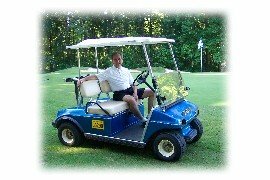 There are over 90 miles of golf cart paths making it possible to get to any store, school, doctor, dentist, neighborhood, or shopping center - all on the golf cart. Driving around along treelined paths and over bridges of bubbling creeks - even I don't mind going to the grocery store to get some milk. Speaking of grocery stores, all of the local stores have special golf cart parking - right by the front door. 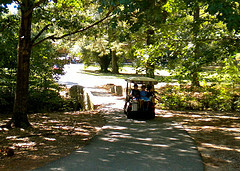 Perhaps you thought that this golf cart community was just for seniors or retired people. Well think again. Here is a picture of one of local high schools - guess how the kids get to school? No more of mom or dad driving them to school. What parent wouldn't want to spend their money on a used golf cart instead of a car?